It’s been a while since I’ve come across a food item that has crossed culinary conventions in such a way to capture my attention. As a result, the Food Scrambler feature hasn’t popped up in Food it is More recently. However, a new food truck is playfully scrambling up traditional sandwiches with different proteins. On my first visit to Fat Duck Mobile Eatery, I got their version of Vietnamese Banh Mi that uses beef cheeks & tongue as their meat filling, aptly named “The Cheeky”. The meat was tender and came in large morsels but was a bit bland. The sandwich got most of its flavour from the hoisin sauce and vegetables. I love how the cook prepared the pickled daikon and carrots. They came in the form of wide ribbons. In this format the vegetables still retained their crunchiness but were flexible to lie in a more visually appealing way in the sandwich than the traditional batons. I actually would like to see Chinese restaurants ribbon their pickled daikon and carrots in some dishes. Image thin ribbons entwined with strands of Jelly Fish in the cold platter at the start of Chinese Banquet dinners. I think this would be awesome. Continuing on, the bread was buttered, crispy on the outside and soft on the inside. The bread is very similar to the buns used by Meat & Bread. The bread did its job in holding together the fairly substantial amount of ingredients in the sandwich. However, I think they may need to dial back the amount of sauce they use, as it made for a very messy and soggy last bites of sandwich. On a second visit, I tried their version of a Philly Cheesteak made with duck confit. 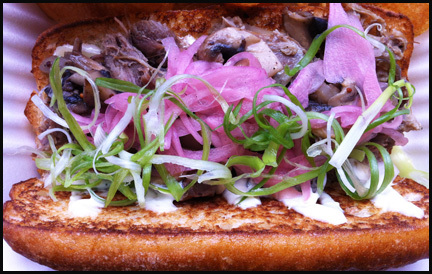 In addition to the tender, sweet and non-gamey duck, there were marinated mushrooms, pickled red onions, shredded green onions, Swiss cheese and a truffle mayo. All the ingredients were sandwiched with the same bread as The Cheeky. 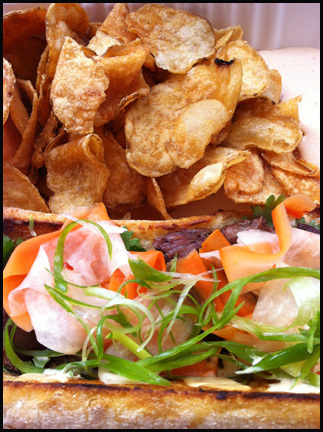 Overall I think I liked Fat Duck’s bastardize Philly Cheese Steak more than their nontraditional Banh Mi. The duck, mayo and Swiss cheese made the ensemble savoury and rich. 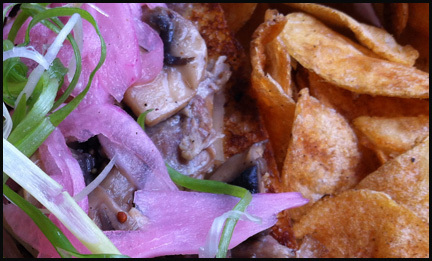 The picked onion and marinated mushrooms provide a contrast with their tartness. I really enjoyed the mushrooms as they gave a big punch of flavour. The duck Philly was also a lot neater to eat than The Cheeky. All the sandwiches come with home made chips, which are deep fried to a beautiful golden brown and served with a delicious Chipotle aioli. The truck’s use of duck is what caught my attention more since I feel it is more unconventional than the actual fusion sandwiches. For me, duck is still a “Special Occasion” protein. It is a meat that is seen at higher end restaurant menus or if prepared at home, eaten on a special day like Christmas. Even though roast duck is common at Chinese BBQ shops, our family actually doesn’t buy it that often either. I think what prevents duck from being an “Everyday Protein” like chicken or beef is that’s not easy to prepare at home due to its fat content and it does have a gamey taste that can be off putting to some. Certainly when you thinking about what to make for dinner, duck is rarely on most people’s radar and as a result it is relegated to the freezer section of most grocery stores. For attempting to change the conventional view on Duck as a “occasional” protein to an “everyday” protein by putting it into the common sandwich, I salute the owners of Fat Duck Mobile Food truck. The Fat Duck Mobile Food truck can be found at the pod of food carts located in front of the Queen Elizabeth Theatre in Downtown Vancouver (on Hamilton Street between Georgia and Dunsmuir Street). They are closer to Dunsmuir street.